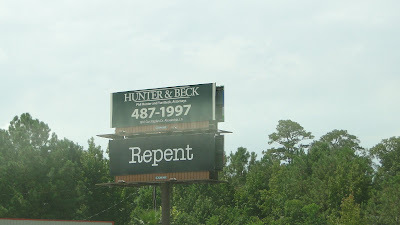 today we ventured over to the parking lot of furniture world in pineville, la. to see a hayride-stump speech by sammy kershaw. 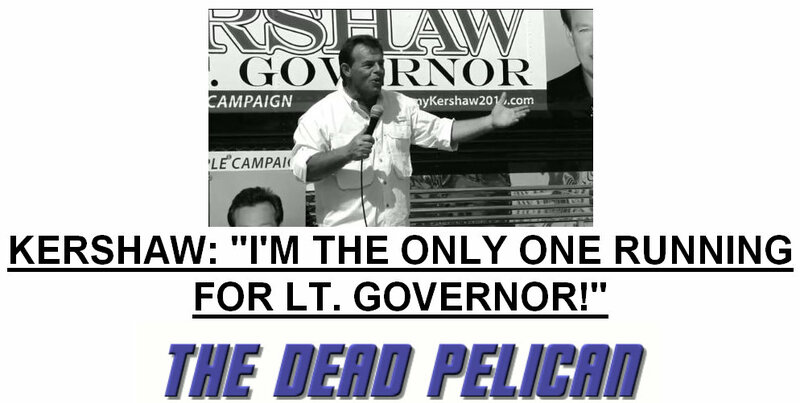 mr. kershaw is running for lieutenant governor in a special election to replace mitch landrieu who this last winter went on to be selected mayor of orleans. this was the first time we've ever had the opportunity to see a professional musician without having to pay first and we even got free swag + it was short and sweet. so that was nice. this playlist is divided into three segments instead of two -- because in the bright sun (today's weather is excellent so far) we couldn't read the counter on the screen at all. we didnt want to run over youtube's ten minute limit. we obviously have no sense of time either. 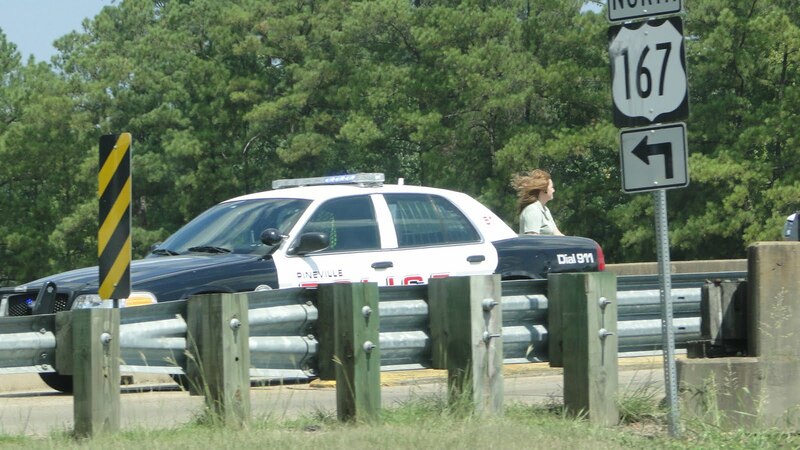 but at least it wasnt windy. much. wouldnt you know it though that a few minutes ago, for the first time, we noticed that youtube has increased their vid length to fifteen minutes. 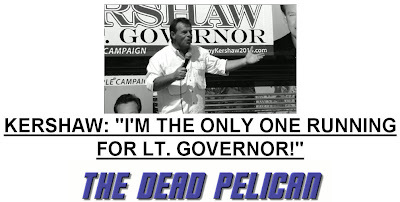 we havent made up our mind who to vote for lieutenant governor. we know who we wont be voting for and that's jay dardenne and roger villere. only a crook or an imbecile would vote for either. we would like mr. kershaw a lot better if he would have repudiated the republican party and ran as a no party candidate. we'll see. wst... is extremely shocked and saddened to learn that jonesville, la bull rider and cowboy corbin carpenter has been killed in an automobile wreck. 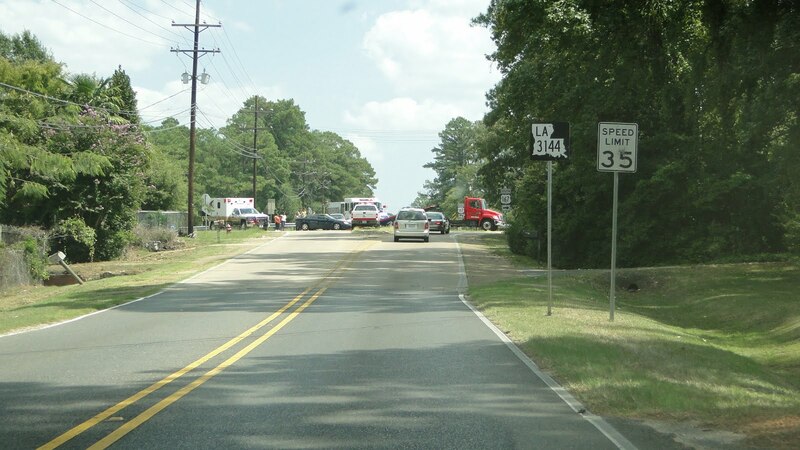 details will not be released until after 2:00 pm cdt from youngs's funeral home in jonesville, louisiana. 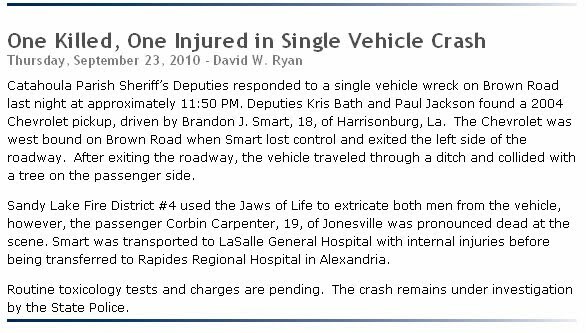 Corbin Carpenter of Jonesville, former LHSRA member and NHSFR qualifier in Bull Riding and Boys Cutting, died last night as the result of a vehicular accident. Please pray for his family who has already suffered so much in these last few months, following the death of his brother-in-law in the Deepwater Horizon tragedy in March. 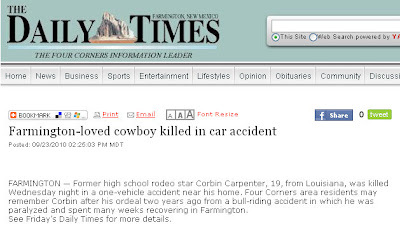 Corbin overcame tremendous odds after being injured at the NHSFR in 2008. 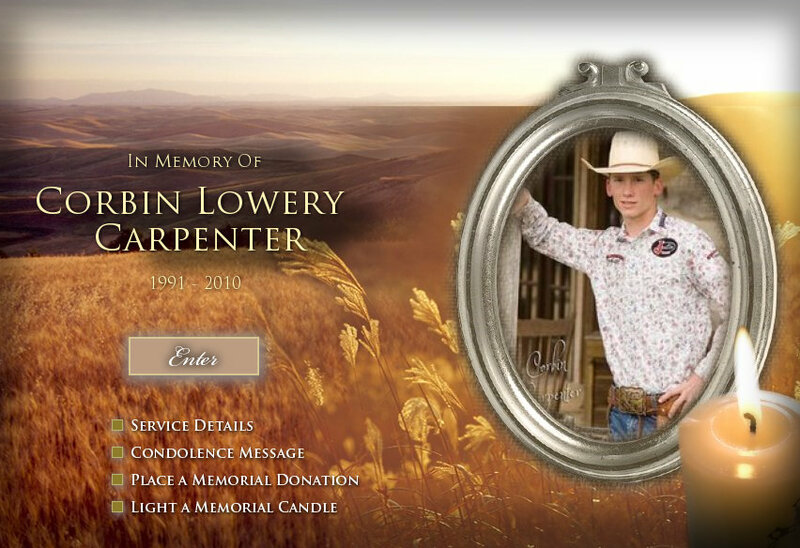 Funeral services for Corbin Carpenter age, 19, of Jonesville La. 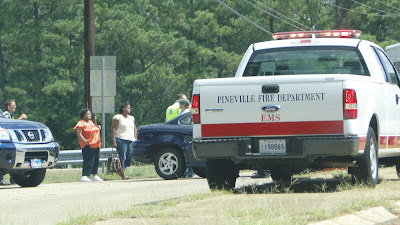 will be 11:00 a.m. on Saturday, September 25, 2010 at Pleasant Grove Baptist Church Jonesville La. with Bro Craig James and Bro. Tilt James of Fellowship of Christian Cowboys officiating. Burial will follow at Heard Cemetery in Manifest under the direction of Young’s Funeral Home of Jonesville. The family will receive friends on Friday, September 24, 2010 from 5:00 p.m. to 9:00 p.m. at Pleasant Grove Baptist Church Jonesville La. Corbin was born on March 9, 1991 to Dewitt L. and Theresa F. Carpenter . 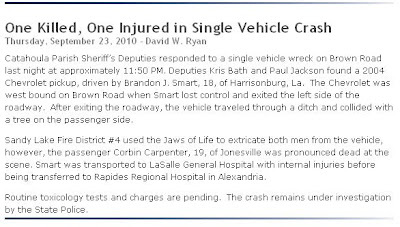 He passed away on Wednesday, September 22, 2010 in Jonesville, La. 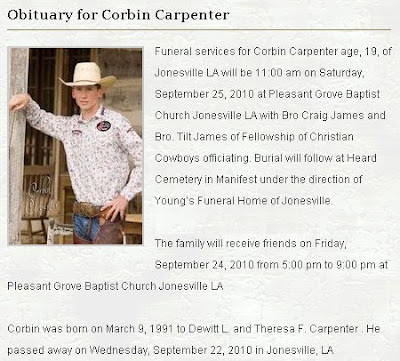 Corbin is a member of Pleasant Grove Baptist Church in Jonesville, LA. 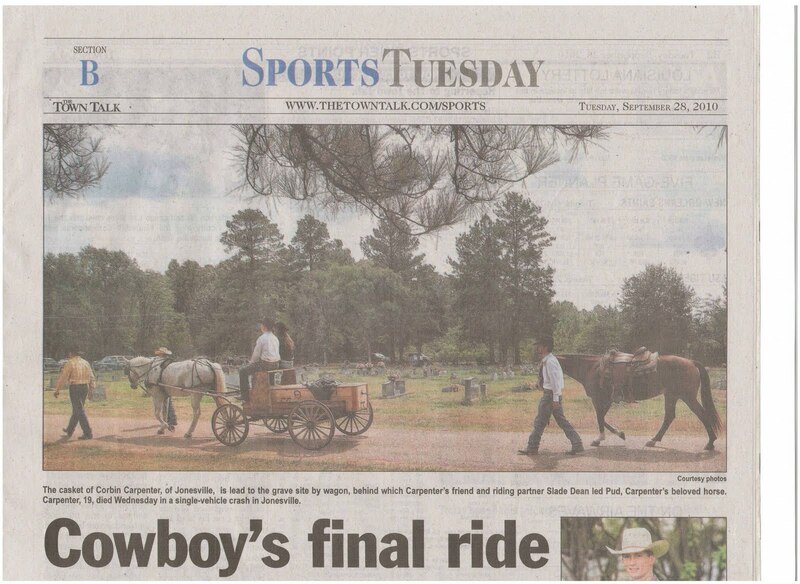 He is a three year member of the Bloomer Trailer Rodeo Team and served two years as captain. He is a five year member of Louisiana High School Rodeo Association, four year member of Northeast Louisiana High School Rodeo Association, US Team Roping Association card holder, 2007 Louisiana State High School Rookie of the Year Bull Rider, National Finals High School Rodeo Qualifier 2006, 2007, 2008, 2010, member of National Cutting Horse Association, and 2007 National Finals Top 10 Bull Rider. In addition, he has won numerous awards and honors. Following his 2008 bull riding accident that caused a spinal cord injury that left him paralyzed he over came many obstacles and never failed to give God the glory. He always had a smile on his face, a joke to tell, and always made people laugh. Corbin loved to wrestle with his brothers and friends. He had a God given talent with horses; therefore, starting his own business of breaking and training horses at the age of fourteen. Rodeo was his passion, but what cowboy doesn’t love to hunt and fish. 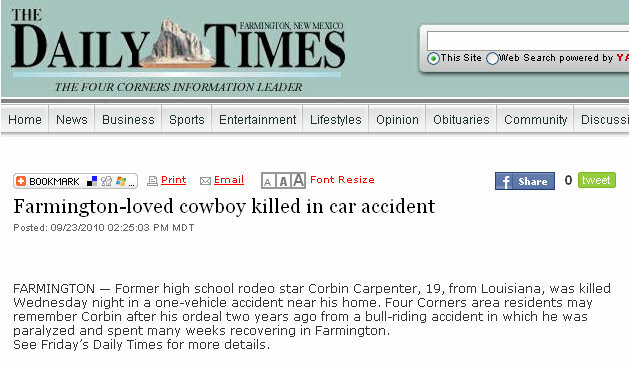 Most of all Corbin loved the Lord with all his heart. He was preceded in death by his paternal grandparents Dewitt R. and Ruby J. Carpenter, Brother in law Roy Wyatt Kemp. He is also survived by numerous aunts, uncles, cousins, friends, and special roping horse, Pud. Pallbearers will be Colter White, Slade Deason, Ethan House, David Austin Chevallier, Shane Hood, Corey Granger, Chris Shivers, Jake Hebert, Hayden Willson, Jesse McClure, Lee White, Colten Blanchard, and Mike White. Honorary pallbearers will be members of the Louisiana High School Rodeo Association and a host of friends. 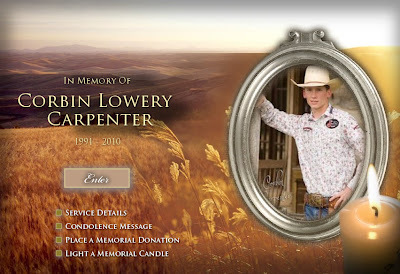 Memorials may be given to Pleasant Grove Baptist Church Building Fund, Justin Cowboy Crisis Fund, or the Corbin Carpenter Memorial Scholarship Fund. candidate for city of alexandria, louisiana, mayor von jennings, appeared after the 8:30 am break on the ksyl talk back program this morning. this is a partial file because just as ksyl was going into their 8:30 commercial break our electricity blinked. by the time we restarted and got set back up it was 8:36.
the complete interview will likely be available for download sometime today from ksyl.com. a recently posted sign outside the former "jamie's lil saline" seafood restaurant at the deville, la. crossroads reads: "coming soon 3 sisters p_zza, subs, blue bell hand dipped ice cream." 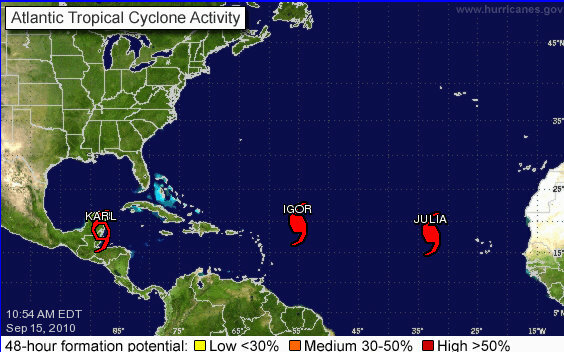 we think that the sisters ought to give louisiana's own kleinpeter ice cream a shot as well. the sign at the far end reads: "avery michaels, a little taste of country, september 23." heres a pic of jamie's lil saline from earlier this month. 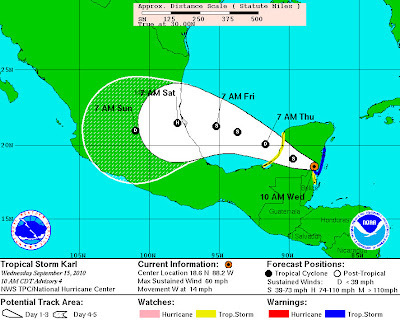 the avoyelles parish sheriff's office recommends checking with avoyellestoday.com as well as kalb and gannett/the town talk. 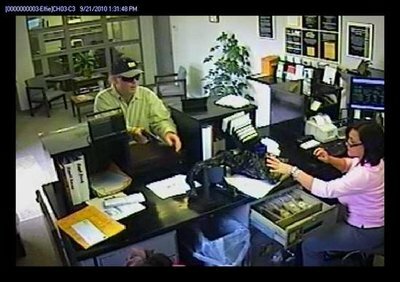 around 1:40 p.m. today a gunman robbed the cottonport bank's effie branch. 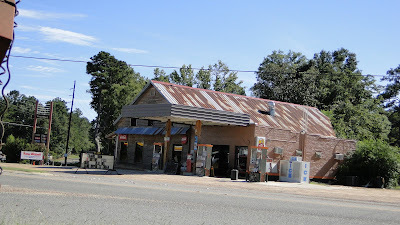 according to the cottonport bank website the effie branch is located at: 2979 Highway 107 telephone: 318-253-6509.
gannett/the town talk reports that the gunman waited until the bank was empty of customers to make his move; getting away with an undetermined amount of (worthless) federal reserve notes but not before leaving the bankers locked in a closet. he might have been driving a 2005 white chevrolet and has long white hair and jeans with black boots. we'll see how long it takes for surveillance cam footage to be released. 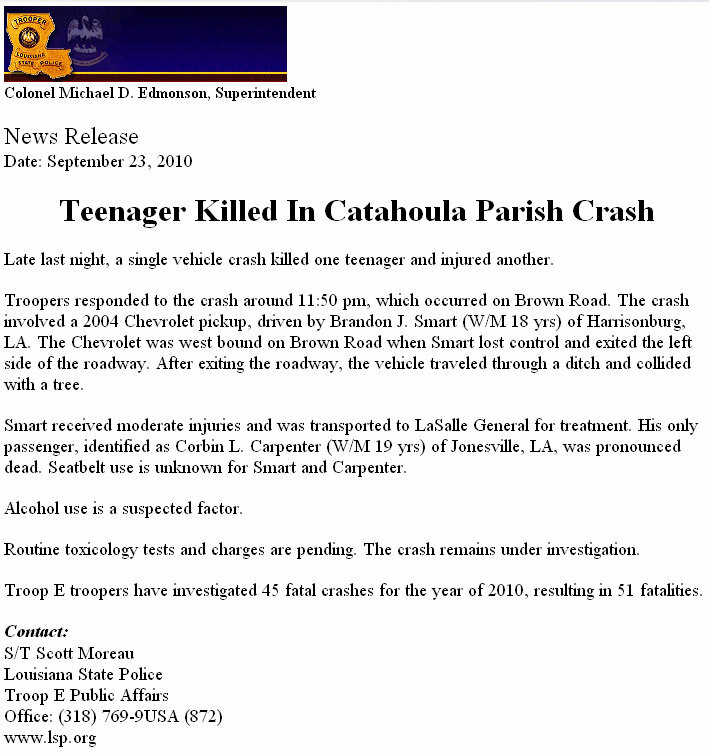 if you have any information please contact the avoyelles parish sheriff's office at 318.253.8085 website. UPDATE: kalb tv-5 has a more detailed report here. UPDATE-2 avoyelles today robber tied two tellers up; search still on for suspect. hotel heiress paris hilton appeared in a clark county, nevada courtroom this morning to plead guilty to cocaine possession and obstructing justice by lying to a police officer. Standing before Justice of the Peace Joe Bonaventure, Hilton admitted that both 0.8 grams of cocaine and the Chanel handbag where it was found were hers and said she was guilty of misdemeanor drug possession and misdemeanor obstructing an officer. 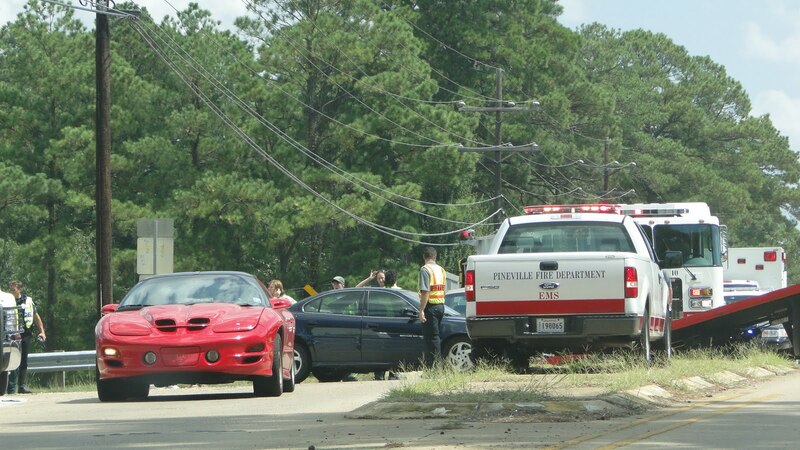 meanwhile, here in louisiana -- the most corrupt state in the nation -- someone from a prominent family who ran over and killed three people -- supposedly while intoxicated, in what some consider one of the most gruesome crime/accident scenes in recent memory -- can stand before a judge and not have to say one word to give account of himself or apologize while being sentenced under the terms of a very plum plea bargain. imagine what the really wealthy, patrician families here in louisiana are getting away with. kudos to the clark county, nevada district attorney for doing his job. 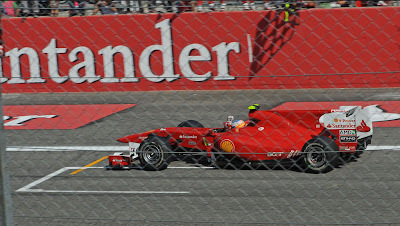 at the aragon, spain, motogp, australian casey stoner aboard his ducati gp10 wins his first race of the season. BATON ROUGE, LA (WAFB) - Shoppers enjoying a Sunday afternoon inside the Mall of Louisiana got a scare after a mid-day robbery caused chaos inside the shopping center. Crowds rushed out of the mall after initial reports indicated shots were fired. Authorities later confirmed shots had not been fired. Rather, two masked thieves had robbed a jewelry stand inside the mall. gannett/the town talk is reporting this morning that yesterday, ninth judicial district court judge, thomas yeager sentenced a deville man to thirty-four years in prison "for two counts of vehicular homicide in a wreck a year ago on the cottingham expressway in pineville." 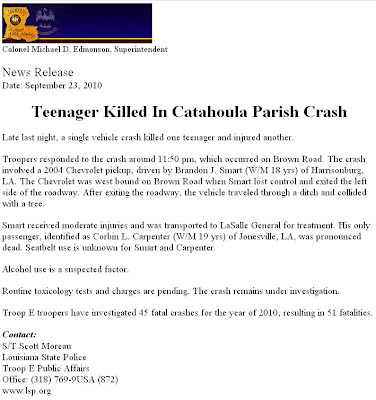 reportedly, jeffrey deville, of deville, louisiana, was driving on the expressway when his truck crossed the median and struck a car killing lsua professor, barbara frye and her companion louis tyner, both of pollock, la,.instantly. 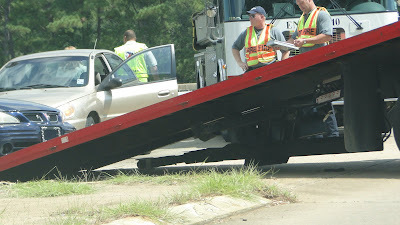 mr. deville might have been intoxicated at the time of the wreck because it was reported "tests showed" that he had "drugs in his system at the time of the crash." so whats the big deal -- 34 years ... that sounds about right eh? well contrast this sentence -- to the one handed down just a couple of months ago, also by judge yeager, in the mysterious case of justin paul brouillette. mr. brouillette, like mr. deville, was also suspected of barreling down the highway under the influence when he ran over and killed three people -- a mother and her two daughters who were walking somewhere on the shoulder of the road. its believed that they too were killed instantly. at the time, it was said that this wreck was one of the most gruesome; heinous accident/crime scenes in recent memory. mr. brouillette from judge yeager, "received a 15-year sentence -- which could be completed within 3-and-a-half years." 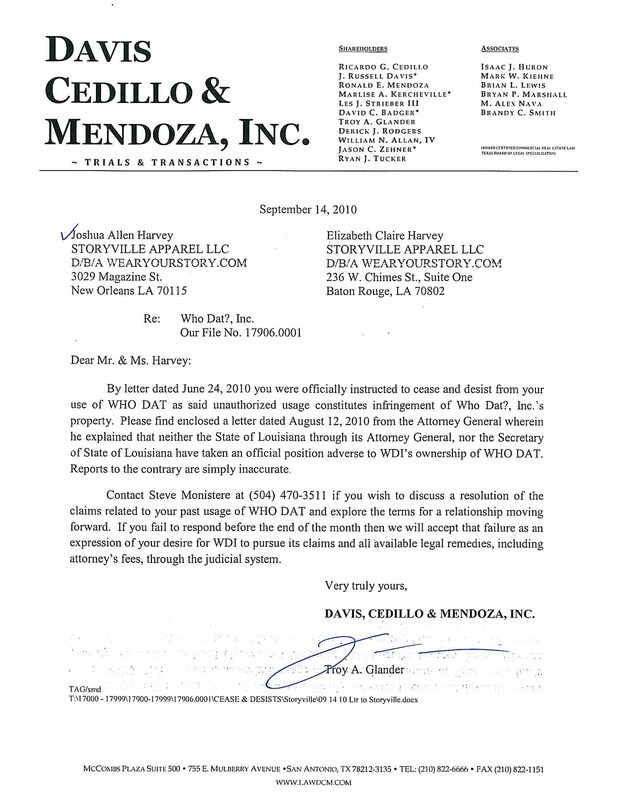 in a 23 may 2010 [original source link] [seven page .pdf 70 kb] column, the gannett editorialist, cynthia jardon, revealed that mr. brouillette comes from a prominent family apparently "with enough cash;" including a mysterious unnamed retired judge and also a suspicious connection between the rapides parish district attorney's office and mr. brouillette's defense attorney. 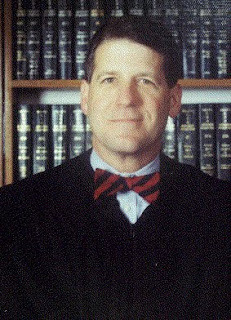 previously, on 11 may 2010, the gannett repeater, abby brown doyle, (this might be important: judge yeager officiated her 27 march 2010 marriage ceremony. [original source link] [two page .pdf 86 kb] gannett/the town talk, 09 may 2010), reported how at sentencing mr. brouillette remained silent. this means that he was not required as part of his plea bargain to allocute to his crime. Allocute generally means to formally declare something...In the legal context, it refers to stating specifically and in detail one's actions and motices, [sic] often in relation to commission of a crime. In most United States jurisdictions a criminal defendant is allowed the opportunity before sentencing to offer an explanation for the crime through allocution. Some jurisdictions provide that this is an absolute right for all defendants, without which, a sentence may be overturned, and a new sentencing hearing must be held. Allocution is sometimes required of a defendant who pleads guilty to a crime in a plea bargain in exchange for a reduced sentence. louisiana style allocution, the loony looziana supreme court teaches us, for example in the unpublished appendix to opinion in state of louisiana v ricky joseph langley, (a capital case) pages 41 - 42, that the right of allocution is a defendants right at the sentencing hearing. in louisiana there is nothing to stop the district attorney from asking for or requiring a criminal to allocute to his or her crime and give account of himself. especially... especially, in exchange for when a criminal receives such a plum plea bargain as it appears happened in mr. brouillette's case. when you read between-the-lines of ms. jardon's piece, doesnt it seem possible that one reason judge yeager, the rapides parish district attorney's office, the mysterious unnamed retired judge and the defense attorney kept out the allocution was to protect the brouillette family's assets? after all, if the victims family filed a civil suit against mr. brouillette, isnt it likely that his allocution in hand would strengthen their case? 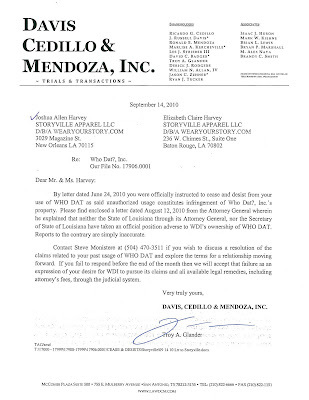 it appears that ms. jardon's questions about the deville case were answered. it doesnt look like mr. deville had a prominent attorney or judge in his family to call in favors for him, or a lot of cash, or a defense attorney playing slap-n-tickle with the folks in the district attorney's office. it's not mentioned whether or not mr. deville allocuted. 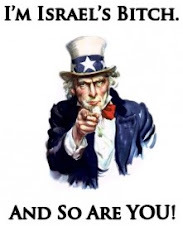 if louisiana had an honest, respectable legislature -- instead of freaks, perverts and criminals themselves, they would immediately move to convene the house judiciary committee in joint session with the senate committees on the judiciary and investigate both of these cases and get to the bottom of what is wrong with our lousy louisiana judicial system and fix it. everyday more and more people become aware of all the fraud and corruption that's going on all around and right out in the open; it's only a matter of time before there are so many millions of angry people that the police and military is forced to get involved and start investigating. more bad judgment by ninth judicial district court judge thomas yeager? pineviille, la. today around 1:05 pm. looks like the police and ems had already cleaned most everything up by the time we passed by. 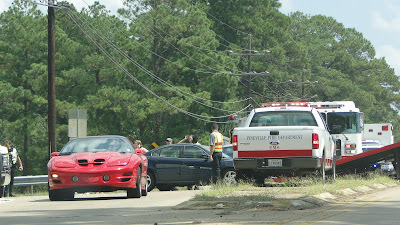 thankfully, it didnt appear that anyone was seriously injured. ATLANTA — That photo of the Rev. Dr. Martin Luther King, Jr. riding one of the first desegregated buses in Montgomery, Ala.? He took it. The well-known image of black sanitation workers carrying “I Am a Man” signs in Memphis? His. He was the only photojournalist to document the entire trial in the murder of Emmett Till, and he was there in Room 306 of the Lorraine Hotel, Dr. King’s room, on the night he was assassinated. 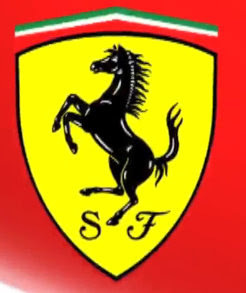 formula 1 is slightly less boring than nascar because at least you have some scenery, buildings, "green spaces" and so forth to look at while they make their way through the circuit, unlike nascar which seems to be round n round an oval track. of course they are probably both more exciting to witness in person. “Winning at Monza at the wheel of a Ferrari is something special, which can only stand comparison to when I won in front of my home crowd in Barcelona in 2006. Being on the podium was an incredible feeling: what a sea of people, so many flags! I was stunned by the emotion from the fans, right from the first moment they got here on Thursday. wst... has learned [insert drudge-esque siren.gif here] that the [reelect] jacques roy (for) mayor campaign website has been updated! giulietio chiesa, journalist, member of the european parliament. "they have this evil organization. they have the leader of this evil organization -- bin laden. they have a secret network in the caves of afghanistan. 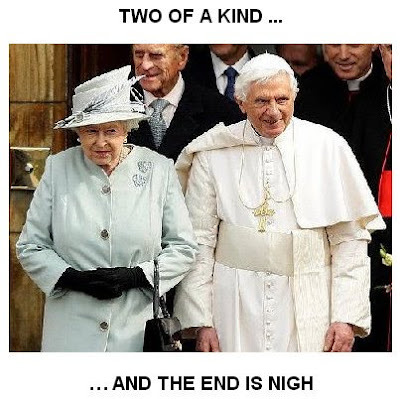 it could be the screenplay of a james bond movie ... obviously they will never catch bin laden because then everybody will think the war on terror is over." michael springman, chief of the visa section at u.s. general consulate, jeddah, saudia arabia, 1987 - 1989 says "during my period there, i was involved in what turned out to be a visa for terrorists program, with people coming to the consulate recruited by the central intelligence agency and its asset usama bin laden .... i believe that the american government was working with various arab and muslim organizations -- whether it was al qaeda or whether it was people that became al qaeda, to be trained, to be armed and to be sent to the balkans to over throw slobodan milosevic and anybody allied with him." that office in jeddah issued many of the visas that were used by the hijackers to enter the united states. marina montesano, university of genoa, author of "american mystery." robert mcilvaine father of robert mcilvaine, jr., deceased on 911, wants to know who murdered his son and says that then attorney general john ashcroft is a liar and so is the u.s. government. "i'm not a conspiracy theorist. i'am a parent looking for the murderer of my son and you have to be a moron to think that nineteen arabs did it." ... "the [american people] should be ashamed for not seeking the truth." he says. william rodriguez, former janitor of the wtc was never called by the 911 commission to testify and neither were others who were present that day. louie cacchioli, north tower survivor, new york city fire department. 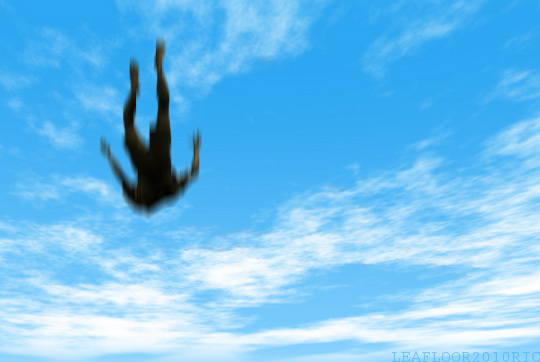 "i was down there searching for nine days but i didnt find anyone alive. i went down there for nearly a year and a half and if i wasnt down there working and searching i was at funerals. they took my friends from me. they took my job from me and i really loved that job and they took my health from me. i do not want people to forget that day."